Joseph Lewis Plut, Jr, age 82 of Crosby died on Thursday, January 17, 2019 at the Cuyuna Range Care Center in Crosby. Joe was born on July 8, 1936 in Brainerd to Joseph and Anna (Satovich) Plut. He grew up in Crosby where he was a lifelong member of St. Joseph’s Catholic Church. He attended Franklin Grade School and graduated as valedictorian of the Crosby-Ironton High School class of 1954. He then attended Saint John's University in Collegeville, graduating in 1958 with a BA in English and a minor in Modern Languages. After completing his undergraduate studies, he moved to New York City where he attended Columbia University and earned an MA in English. While in New York, Joe also worked as a legal secretary for a railroad company near Wall Street and for Metro-Goldwyn-Mayer, doing legal research for the TV series, Dr. Kildare. 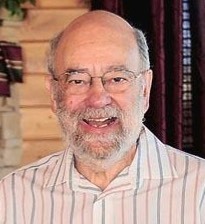 Upon returning to Crosby in 1964, Joe applied for a teaching position at Brainerd Community College (now Central Lakes College), where he began teaching English and Humanities in the fall of 1965. During his tenure, Joe taught thousands of students and became fondly known as the “Mad Hugger”. His popularity led to an appearance on the NBC TV show “REAL PEOPLE,” and an interview with “PEOPLE” Magazine. Joe enjoyed the theatre and appeared in the BCC/CLC productions of “Love Letters,” “Music Man,” “Tea House of the August Moon,” and “Barefoot in the Park.” He also loved to travel and led many educational trips to England. Joe retired from teaching at CLC in June of 2001. In retirement, Joe authored Conversations with Jon Hassler, honoring his lifelong friend. He also enjoyed traveling to Europe and spending time with family and friends. Joe is survived by his brother, Robert (Rosalyn) Plut, Brainerd; sister Judith (Gary) Saulter and two nephews, William and Brandon, Sioux Falls, SD; cousin Mary Lou (Alvin) Houle and family, Ironton; cousin Barb (Paul) Beyer, Fergus Falls; cousin Francis (Shirley) Satovich, Hibbing; cousin Betty Wilson (Plut), Minneapolis; and cousin Jim Plut, Belle Fourche, SD. Joe is preceded in death by his parents and his niece, Veronica Saulter.